As the 2012 Presidential election has come to an end, I find myself intrigued by the extent of social media both candidates churned out during their presidential campaigns. ABC News stated that the 2012 Election, as a whole, was one of the most shared and commented-on events in social media history. Via Facebook, Twitter and other social media platforms, both campaigns attempted to build personal relationships with voters to gain their support. However, even a slight mistake on social media, and it might have not been easy for either candidate to make amends with their supporters. Does that mean then that all businesses should stray away from social media due to the risks associated? NO! Social media is a great research tool and monitoring platform for businesses to utilize. Whether you are just starting or already use social media these Do’s and Don’ts will help your business bypass common mistakes and effectively employ social media. Implement a plan before you start. Build a strong network and engage regularly with your network. Keep your messages relative to your business. Employ social networks that are relevant to your public. Respond to input quickly to show that their feedback is important. Identify negative comments and respond in a professional manner. Use hash-tags to focus your message to a certain target. Use monitoring tools to track your businesses’s buzz. Use more than two hash-tags in a comment or tweet. Engage in social media if the benefit isn’t worth the cost. Continually sell your product or service. Forget to thank people when they promote your business on social media. Adapted from, “Social Media Etiquette: 15 do’s and don’ts” by socialmediatoday. This entry was posted in Marketing, Tips & Tricks, Uncategorized and tagged Business, Facebook, hash-tag, network, social media, social media do's and don'ts, Twitter on November 8, 2012 by Bloomington Chamber Staff. These days, many nonprofits raise as much money through high-profile fundraising events as they do through such traditional fundraising channels as fund drives, donor solicitations and direct mail. Sponsorships are different from donations in that they explicitly offer publicity in return for money, which is why they are generally geared toward businesses. Sponsor benefits can range from logos on t-shirts to an invitation to hand out awards onstage. If the event involves a meal or admission, sponsors usually receive free tickets, perhaps an entire table. Participation can be a substantial part of the benefit, and sponsors are usually asked, or even expected, to attend the event and provide their banner and logo. There is nothing wrong with getting the most bang from your sponsorship dollars, and doing so helps out the organization you are supporting. You paid the money. Now, what can you do to get the most out of your sponsorship? Set clear expectations when you commit. What level of sponsorship are you purchasing, and exactly what will you receive in return? Will you receive logo recognition, or name only? How and where will your brand be displayed? in advertisements? hot linked on a website? a banner at the event? How many complimentary tickets will you receive? You need to know these things before you can take full advantage of your sponsorship. Look for exposure opportunities that go beyond just what’s offered up front. Ask the event organizer if they need promotional giveaways, goodie bags, door prizes, or silent auction items. This will get your name in front of more people, and help out the organization as well. Organizers view attendance as a key measure of the event’s success, second only to how much money it generated. Make sure you promote the event within your business, and not just at the owner or management level. Your employees will be proud that you are supporting a worthy cause, and the organization you are supporting will always appreciate more attendees. Ask if there’s a way to get discounted tickets in addition to those included with your sponsorship. At the event, have your team wear their nametags and appropriate logo wear. If possible, don’t seat all your attendees at the same table. Tell them to spread out so more people are aware of your support. This has the added benefit of offering networking opportunities for your people. For most nonprofits the week of the big annual fundraiser is the most demanding time of the year. Ask if your business can provide volunteers to help out before or during the event. In return, you will create more goodwill, and increase your visibility. Protect your brand. Keep your banner clean and flat, with no tatters or tears, and with enough grommets so that it hangs straight from any wall or suspension system. It’s good to have banners in several different sizes, as some venues offer limited (or unlimited) room for display. Make sure the logo file you provide is high resolution – you don’t want your logo to look pixilated when it’s blown up on a projector. Publicize the event on your website and with your employees and customers. Hang up a flier in your store or office, and offer to sell tickets. These are all ways to draw attention to your support for the cause and foster affinity with people who are important to you. If you don’t plan to use all your tickets, tell the event organizers as soon as possible. If there’s a meal, they need to give the caterer a head count often a week or more in advance. Or ask to ‘donate back’ your tickets for other attendees, perhaps awardees, which helps the organization cover costs. After the event, ask for a summary of your benefits. Did the organizers do everything they promised? How often did the advertisement run on the radio, and on which stations? How many hits did they get on Facebook? Did your logo get any hits on their webpage? Information like this helps you manage who saw your brand and make comparisons with other sponsorship opportunities out there. If you are dissatisfied, tell someone. Many nonprofits rely on volunteers to help with events, and things can get lost in the frenzy leading up to a big event. Most nonprofits are small enough that you can bring your concern directly to the attention of an executive director or program manager. It might have happened to others too, and the organization can’t address the problem unless it’s aware of it. The Greater Bloomington Chamber of Commerce holds many sponsored events throughout the year, offering a wide range of sponsorship levels and benefits to accommodate businesses of all sizes. We’re pleased to be able to share these suggestions based on our years of experience. Do you have some suggestions of your own? Visit our LinkedIn discussion group and let us know what they are. This entry was posted in Mosaic Initiative and tagged Business, Chamber, donation, event, mosaic, sponsorship on June 21, 2011 by Bloomington Chamber Staff. Help us grow the collective voice of business! The Big Invite! 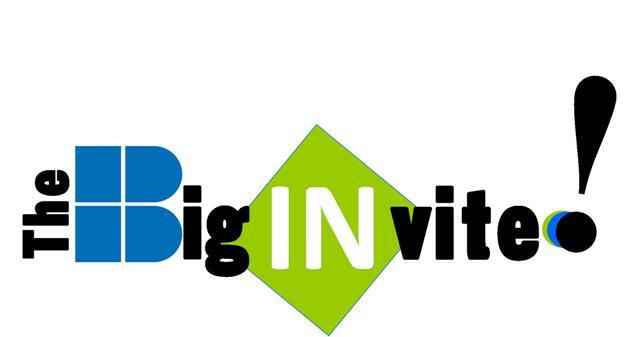 The Greater Bloomington Chamber of Commerce is excited to announce its new initiative to grow the voice of business in our community — The Big INvite! Believing that members are the foundation of our organization, The Chamber is looking to strengthen that foundation and increase the collective voice of business with this important membership initiative. The event will be held on Tuesday, June 28th at the Clubhouse at Cedarview Management’s “10th & College” Building. Volunteers representing a cross-section of Chamber member businesses are expected to participate in The Big INvite, working on the premise that a phone call from a friend or colleague regarding Chamber membership is the best testimonial possible. More than 120 Chamber member volunteers will participate in the day’s activities that will include refreshments and friendly competition among the various teams of volunteers. “The Chamber is a membership organization and many businesses believe they have to be invited to become a Chamber member. While this isn’t the case, an invitation to join from a friend or professional colleague is a wonderful way to become involved,” said Mary Jo Orlowski, account executive with The Chamber. An “After Party” is planned for the volunteers and will be held immediately following the event at Grazie! Italian Eatery from 4:30-6:30pm with hors d’oeuvres, wine & beer provided. Interested in being part of The Big Invite! Want to encourage your peers, business associates, etc. to join the Bloomington Chamber to grow our voice in the community, provide more services for all members and expand our community’s business network? Sign up to volunteer from either 8-11am or 1-4pm to compete for bragging rights and be a part of this important Chamber initiative! Contact Mary Jo Orlowski at morlowski@chamberbloomington.org or 336-6381 to get INvolved in The Big INvite! This entry was posted in Events, The Big INvite, Uncategorized and tagged Business, Chamber, competition, fun, invite, Membership, Referral, testimonial on June 20, 2011 by Bloomington Chamber Staff. Bloomington has a robust nonprofit sector that fills a wide range of important community needs, including emergency services, education, public health, historic preservation, supporting the arts, protecting the environment, and others. Without critical charitable support from for-profit businesses, these services would struggle to exist. Philanthropy takes many forms, and includes much more than just outright monetary donations. Most nonprofits depend on businesses to sponsor events, purchase tickets, and provide volunteers. Businesses also bring valuable perspectives and leadership to nonprofit boards and commissions. In addition, hiring people in supported employment – for example, persons with developmental disabilities – provides benefits to businesses, but also satisfies crucial community needs. We’ll solicit insights from our Chamber members who give back, highlighting their involvement and sharing their various philanthropic approaches. We’ll also feature a few of our many nonprofit Chamber members to hear their perspectives on how private businesses help them fulfill their mission. Future projects may include member surveys, guidebooks, and research on local giving. All this will be available on a new area dedicated to the Mosaic Initiative on our Chamber website . For now, we want to hear from you about how you handle multiple charitable requests. What do you consider before you write a check, volunteer, or join a board? Check out our new Mosaic discussion group on LinkedIn, and stay tuned to our website for valuable resources, as well as opportunities to tell the story of your own community involvement. We’ll solicit insights from our Chamber members who give back, highlighting their involvement and sharing their various philanthropic approaches. We’ll also feature a few of our many nonprofit Chamber members to hear their perspectives on how private businesses help them fulfill their mission. Future projects may include member surveys, guidebooks, and research on local giving. All this will be available on a new area dedicated to the Mosaic Initiative on our Chamber website at www.chamberbloomington.org. For now, we want to hear from you about how you handle multiple charitable requests. What do you consider before you write a check, volunteer, or join a board? Check out our new Mosaic group on LinkedIn, and stay tuned to our website for valuable resources, as well as opportunities to tell the story of your own community involvement. This entry was posted in Mosaic Initiative and tagged bloomington, Business, Chamber, charity, giving back, mosaic, nonprofits, philanthropy on June 13, 2011 by Bloomington Chamber Staff. It is an annual tradition with a 25 year history of offering businesses an opportunity to showcase their wares to Monroe County. This year was no exception to the excellent one day, B2B trade show that Business Expo has always been known for. The Greater Bloomington Chamber of Commerce vendor booth experienced steady traffic throughout the event. It was great visiting with current and potential members, plus the general public as they strolled by. Many attendees were pleased to learn of the new and extensive menu of programs and events The Chamber has scheduled this year. They also had the opportunity to learn about the augmented benefits Chamber membership has to offer with the new Membership Investment Level model. The BIRA sponsored Taste of Expo was a good example of “the best in local food”. Plus it was tasty. That was obvious with the plates of food being devoured all around. This is the part of the Expo that really draws a crowd. I met new contacts, potential business members and was able to re-connect with others that I have not seen in awhile. That is what the Expo is all about. Again, kudos to Business Expo 2010 for a job well done. This entry was posted in Uncategorized and tagged B2B, bloomington, Business, Chamber, Convention Center, Expo, Monroe County, SBDC on April 29, 2010 by Bloomington Chamber Staff.